Aiko means 'the one you love' in Japanese. 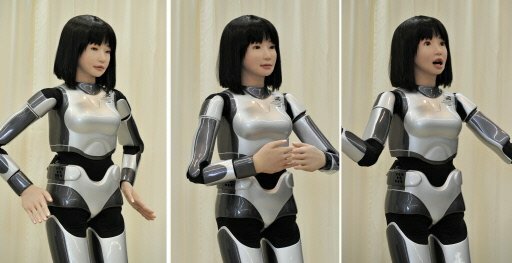 It is the last name for SHE 3PO, a robot designed as a precursor of what will be the wife of the future, an intelligent android… The Aiko project was launched on personal funds by a Canadian engineer of Japanese origin, August 15, 2007. Quickly it becames reality, the robot has made several appearances at events in Canada. Currently the inventor is working on vision and facial expressions. He hopes to raise funds to give legs to his artificial creature. He spent $14000 to build this robot. She is entirely programmed and the program may change according to the needs of the owner. - She can recognize a face. - She reacts when being touched. - But she does not walk. The inventor is searching for money to continue the development. Aiko follows the objects of the eyes and tries to learn to speak. There are several videos on the project site. It is inconclusive, Aiko is primarily a doll with a computer in the body. The idea of ​​building Androids resembling humans goes back a long time. Automata of Jacques de Vaucanson have amazed the people of the 18th century. Designed with the means of the time, they offered a very limited facsimile of the man. Current androids are just a little more sophisticated and take advantage of advances in computer (program), electronics (sensor), and new matéraux (silicone). But trying to create an Android now in 2012, I think it is to want to cut corners. Even if we can give the robot a very credible human appearance, so that one can not distinguish it from a person, once the interaction starts, things go wrong. The machine is jerky, a lack of expression and artificial behavior makes people uncomfortable. It would seem more reasonable to first develop robots at work, and then household robots that have a greater interaction with people, before reaching artificial humans, the Androids. This robot made for its own account by a Taiwanese (which cost him $ 50,000) is able to speak and move. What it lacks is the agility and understanding, she knows especially winking, besides that,, it's a baby robot in a woman's body! 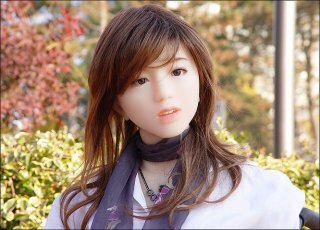 We will see in future parades of fashion a unexpected manequin: Ucroa is an Actroid, a robot with a human face dedicated to human tasks. This 1,58 meter height actroid moves as a woman and makes similar gestures. It is the result of a research project of US$ 2 millions. Beside a Japan Institute, the french CNRS is involved in these developments, which lasted for 3 years. This robot has 30 joints, and obeys to voice orders or digital signals. Beside this very media job of model, she and future models will be rather used to perform tasks too arduous to humans and especially to test new equipments.